How Far is Altis Sri Gayathri Doctors Nest Phase II? Located 10 kms. 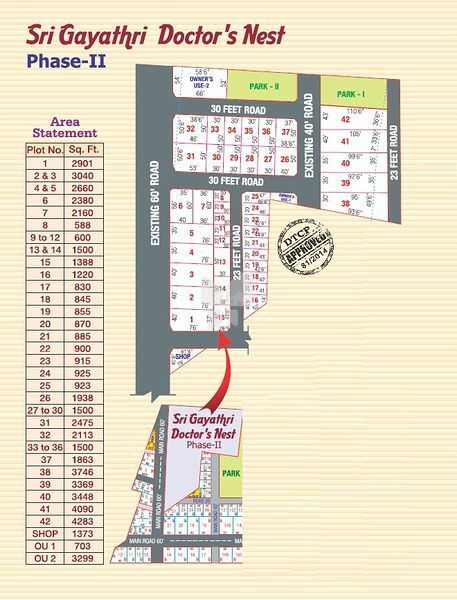 from Tambaram and 12 kms from the proposed airport in Sriperumbudur & 20 minutes drive to Chennai Meenambakkam international airport Sri Gayathri Doctor's Nest is a prime property. It is a DTCP approved gated community in 85 acres of land with 750 plots, proposed school, 14 shops, 12 parks with in the community. The entire 85 acres of land is fully fenced. Water and electricity connections are provided for all the plots. Premier Institution Dhanalakshmi engineering college is just opposite to Doctor’s Nest and Good earth residential school in 400 meters away from it. Asia’s biggest hospital and medical college (Ramachandra Medical College) is just 20 minutes’ drive from Doctor’s Nest. The largest SIPCOT at Oragadam is 20 minutes’ drive from Doctor’s Nest. With Kishkinta Theme Park located 5 Km away, Fun and Frolic is here to stay. This community guarantees the owner privacy and the feeling of being close to nature. With Luxury and ambience comes the trustworthiness of Altis Realty. Quality and commitment to the comfort of the clients rank foremost which is well reflected in the specifications of the project. The door to content living opens to Sri Gayathri Doctor's Nest.